Hamsters reproduce a lot, and their gestation is quick, too, lasting approximately three weeks. You may not know your hamster is pregnant until she is close to or in the process of giving birth. If your hamster has had access to a male hamster, seems to have gained significant weight over the course of a week or is behaving aggressively with you or cage mates, she's liable to be close to having babies. Hamsters can have as few as one and as many as 20 pups in a litter. Seven is average. If your hamster is expecting a sizable liter, her weight gain will be obvious, especially toward the end of her pregnancy. You may also see the appearance of teats on her underbelly. Be careful handling your hamster at this time, as she is likely to be jittery and may bite. A mother hamster preparing for birth will exhibit nesting behaviors. This may involve shredding bedding or piling it up a corner. She may drink much more than usual and store food under her nesting area. Don’t disturb her nest or try to “help her” physically. Instead, provide extra clean bedding materials and move other cage mates to a new location, as they may disturb the mother or hurt her babies. Additionally, a new mother is fertile right after giving birth, so you don’t want to risk unintentional breeding. Hamsters give live birth. Once the process begins it could happen quickly or take several hours. The mother will clean each baby as it is born and tuck it underneath her body to nurse and keep it warm. Don’t intervene during this process, as it could cause your hamster stress that might result in her harming her babies. If you notice birth in progress, give her privacy and a quiet environment. Don’t attempt to clean the cage or touch the babies during the first few days; justmake sure the new mother has plenty of food and water. After the babies are a few days old, you can gently replace bedding in the area outside the nest. 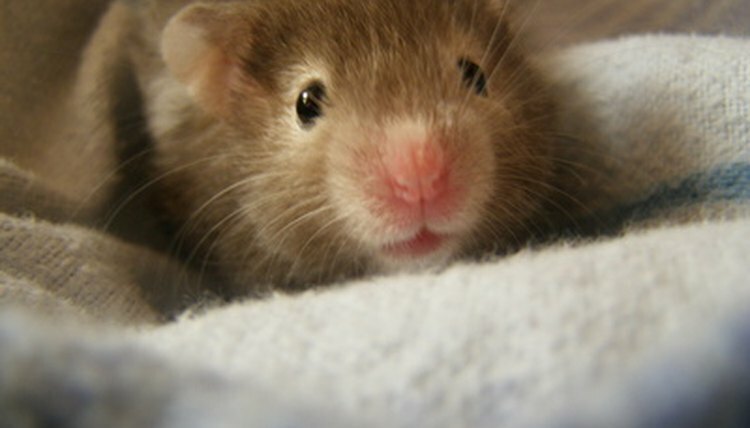 Hamster babies will be weaned and mature enough to leave their mother at 3 to 4 weeks of age. If you keep the babies longer, separate them into gender-specific living groups unless you want several new batches of baby hamsters.